All-but-forgotten in the contemporary vaporwave scene of 2018, GOLF SWINGERS released some of the first-ever vaporwave back in 2011, with a couple releases as far back as 2008 and 2007. It was also one of the first vaporwave “groups”, being comprised of a duo from Ohio named Mr. Leg and Ormo, setting the stage for death’s dynamic shroud.wmv and ２８１４ several years later. 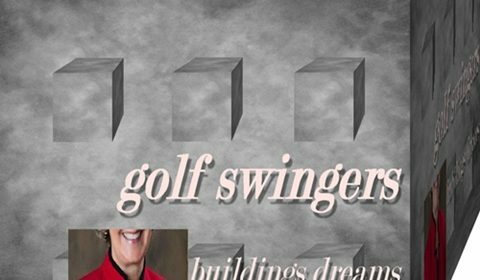 GOLF SWINGERS is emblematic of the weirdness of early vaporwave and “proto-vaporwave”, as nebulous as the latter term may be. Their final release Buildings Dreams comprised a mix of Far Side Virtual-esque MIDI jams and lo-fi plunderphonics that aren’t too far removed from signalwave or broken transmission. The album artwork utilizes a mid-90s corporate aesthetic that looks like it’s trying just a bit too hard to show they’re an innovative business, what with the pre-rendered background and drop shadow text that scream “early computer design”.1 It’s a cluster of disparities wrapped up in a package that sounds not like it’s falling apart but eating itself alive one bit at a time. The songs swap back-and-forth between mid-fi and extremely lo-fi samples several times within the same track, making Buildings Dreams feel much longer than its seventeen minutes by virtue of so much going on.2 GOLF SWINGERS make extensive use of looping, with most samples repeating themselves for several measures, occasionally with degradation with each loop. The samples rarely have any association with each other, with no exception made for juxtaposition within the same track. A single track can go from an adult contemporary sample that’s barely a quarter of a second long to stuttering bass to pseudo-drone only to be immediately followed up by uptempo classic-style vaporwave that then glitches out like a hard drive failure – specifically, the three-and-a-half minutes of tracks “lakes” and “$nd”. 1This is actually one of the most quote-unquote normal album artworks of the GOLF SWINGERS discography, with the design for the self-titled being a bizarre, glitched mess. 2Something I’d argue that broken transmission and signalwave have in common with grindcore. 3And who the hell tagged this as “dub techno” on RateYourMusic?